Apache CXF Fediz is a subproject of Apache CXF which implements the WS-Federation Passive Requestor Profile for SSO specification. It provides a number of container based plugins to enable SSO for Relying Party applications. These plugins are potentially vulnerable to DoS attacks due to the fact that support for Document Type Declarations (DTDs) is not disabled when parsing the response from the Identity Provider (IdP). This is the seventh and final blog post on a series of new features introduced in Apache CXF Fediz 1.2.0. The previous post looked at the new REST API of the IdP. Up to now, we have only covered the basic scenario where the application and the IdP are in the same realm. However, a more sophisticated example is when the application is in a different realm. In this case, the IdP must redirect the user to the home IdP of the application for authentication. The IdP has supported this functionality up to now using WS-Federation only. However, the 1.2.0 IdP supports the ability to redirect to a SAML SSO IdP, thus acting as an identity broker between the two protocols. We will cover this functionality in this tutorial. 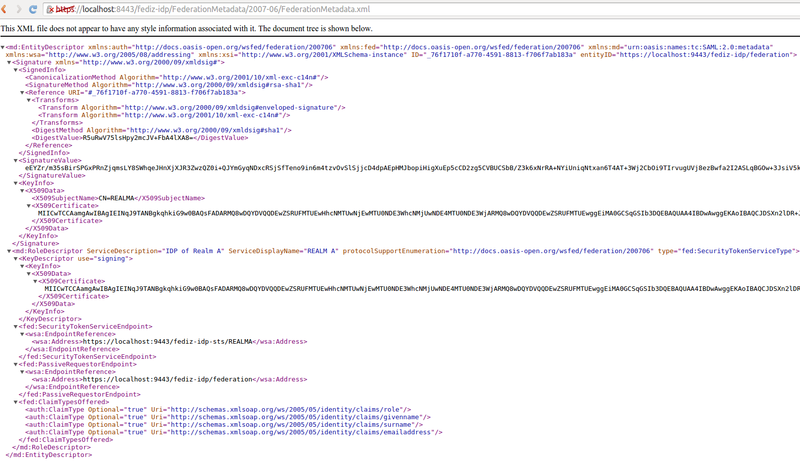 This tells the IdP that the application is to be authenticated in "realm-B". Change the "url" value to "https://localhost:8443/samlssoidp/samlsso". sign.request - Whether to sign the request or not. The default is "true". require.keyinfo - Whether to require a KeyInfo or not when processing a (signed) Response. The default is "true". require.signed.assertions - Whether the assertions contained in the Response must be signed or not. The default is "true". require.known.issuer - Whether we have to "know" the issuer of the SAML Response or not. The default is "true". support.base64.encoding - Whether we BASE-64 decode the response or not. The default is "true". support.deflate.encoding - Whether we support Deflate encoding or not. The default is "false". 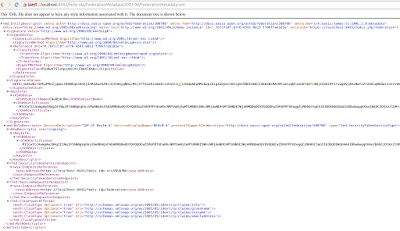 You will see that the Fediz IdP will redirect the browser to the mocked SAML SSO IdP for authentication (authenticate with "ALICE/ECILA") and then back to the Fediz IdP and eventually back to the client application. This is the sixth in a series of posts on the new features of Apache CXF Fediz 1.2.0. The previous post looked at Single Sign Out support in Fediz. In this article we will briefly cover the new REST API of the Fediz IdP. Prior to the 1.2.0 release all of the IdP configuration was done in a static way using Spring. If the IdP administrator wished to change the claims for a particular application, then the change would necessitate restarting the IdP. In contrast, the Fediz 1.2.0 IdP persists the configuration to a database using JPA. In addition, it allows access to this configuration via a REST API powered by Apache CXF. services/rs/idps - An IdP for a given realm. services/rs/claims - The claims that are available in the IdP. services/rs/applications - The applications that are defined in the IdP. services/rs/trusted-idps - The trusted IdPs that are defined in the IdP. services/rs/roles - The roles associated with the REST API. For much more information on how to use the new REST API, please see Oliver Wulff's blog on this topic. This is the fifth in a series of posts on the new features available in Apache CXF Fediz 1.2.0. The previous article described a new container-independent Relying Party (RP) plugin available in Fediz 1.2.0 based on Apache CXF. In this post we will take a look at two new features, support for Single Sign Out and the ability to publish metadata for both RP plugins and the IdP. logoutRedirectTo - URL landing-page after successful logout. This document describes the endpoint address of the service, the realm of the service, and the claims (both required and optional). The metadata document can also be signed by specifying a "signingKey" in the Fediz configuration. This signed document describes the URL of the STS, as well as that of the IdP itself, and the claims that are offered by the IdP.